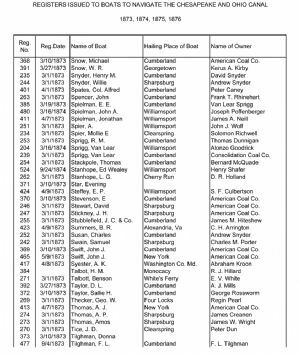 368 3/10/1873 Snow, Michael Cumberland American Coal Co.
239 3/1/1873 Sprigg, Van Lear Cumberland Consolidation Coal Co.
370 3/10/1873 Stevenson, E Cumberland American Coal Co.
246 3/1/1873 Stewart, David Sharpsburg American Coal Co.
247 3/1/1873 Stickney, J. H. Sharpsburg American Coal Co.
369 3/10/1873 Swift, John J. Cumberland American Coal Co.
465 5/9/1873 Swift, John J. New York American Coal Co.
413 4/7/1873 Thomas, A. J. New York American Coal Co.